We meet at the Tewkesbury Leisure Centre, Gloucester Road, Tewkesbury, GL20 5TT, a venue boasting many facilities. 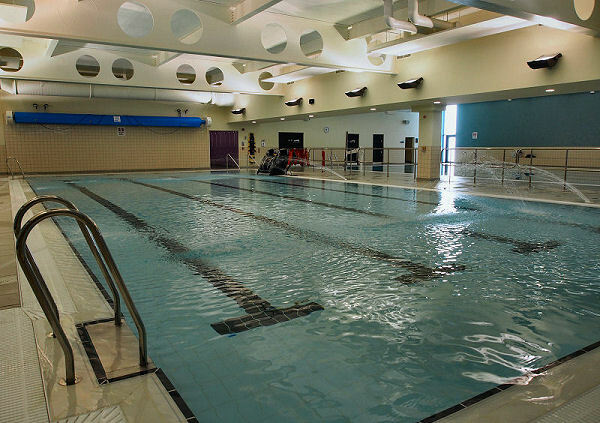 There is a twenty-five metre pool for serious swimming and a second, warm, 20 metre pool, alongside it. The smaller pool has water sprays along the sides and an area adjacent to the pool with cascading water features. Floats and beach balls are available for anyone who wants them and adjacent to the main pool, there is a steam room and a sauna. Left is the 25 metre main pool. This is usually divided into three sections. Two to provide lanes for serious swimmers and the remaining width of the pool for more “social” swimming. Below is a view of the steam room, located directly off the main pool, the door of which can be seen at the extreme right of the main pool photograph (left). Middle left is the 20 metre pool, featuring water sprays along the sides and a cascading water area (bottom left picture), located off to one side. A view of the sauna, located adjacent to the steam room is shown in the photograph below.